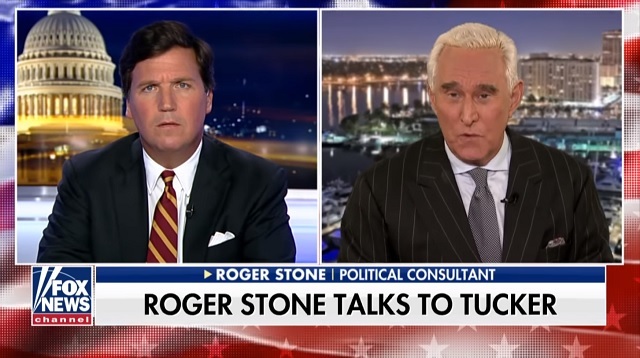 Roger Stone had a powerful appearance Friday night on Tucker Carlson Tonight where he talked about how he can't even afford health insurance as a result of Robert Mueller's witch hunt effectively bankrupting him. Former Trump adviser Roger Stone said in a Fox News interview Friday that the indictment brought against him as part of Special Counsel Robert Mueller's Russia investigation is "thin" and is really "about silencing" him. But, Stone said, he was prepared for the fight of his life. "There's a war on alternative media," he said. "There’s a war where they’re trying to criminalize political expression. There’s a war where they’re trying to criminalize free speech." "I’m in for the fight of my life but I will not quit. I will not fold. I will not bend. I will not bear false witness against the president," Stone said. "I intend to fight because this indictment is fabricated. This indictment is thin as can be." [...]The indictment unsealed Friday does not charge Stone with conspiring with WikiLeaks, the anti-secrecy website that published emails of Democrats during the 2016 campaign, or with the Russian officers Mueller says hacked them. Instead, it accuses him of lying about his interactions related to WikiLeaks' release during probes by Congress and Mueller’s team. One of the craziest elements of this show was that Tucker didn't cut to a commercial until around 35 minutes into the program due to the ongoing advertiser boycott (which is due to monologues like the one he gave last night). Regardless, Mueller and his deep state cronies are doing to Stone exactly what they did to everyone else who helped Trump win his campaign -- they're using the full power of the state to manufacture "crimes" out of thin air. This is literally the most despicable tactic a government prosecutor has at their disposal and it's almost the only tactic Mueller has used to persecute everyone connected to Trump. It's a really tough call!